Denise is my last student on a Friday – 1:30-3:00. As I leave BTL right after her class, I sometimes see her on the phone or collecting her things on my way out. Today I saw her on the phone, shopping bags in tow, on Boulevard Haussmann as I was walking to Saint Lazare. I waved with a smile, and she waved back and approached me. “Hello! My husband is . . .” Denise paused as she searched for the word. “Yes – late! My husband is late!” she cried indignantly. Ahh . . . to be married to a French woman. Okay, I know it was yesterday, so happy post-Australia Day! 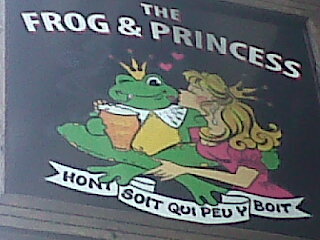 Last night Mr Frog and I went to The Frog and Princess, where we drank two carafes of Australian cabernet, and every glass started with a toast to “Australie!” I felt very patriotic. 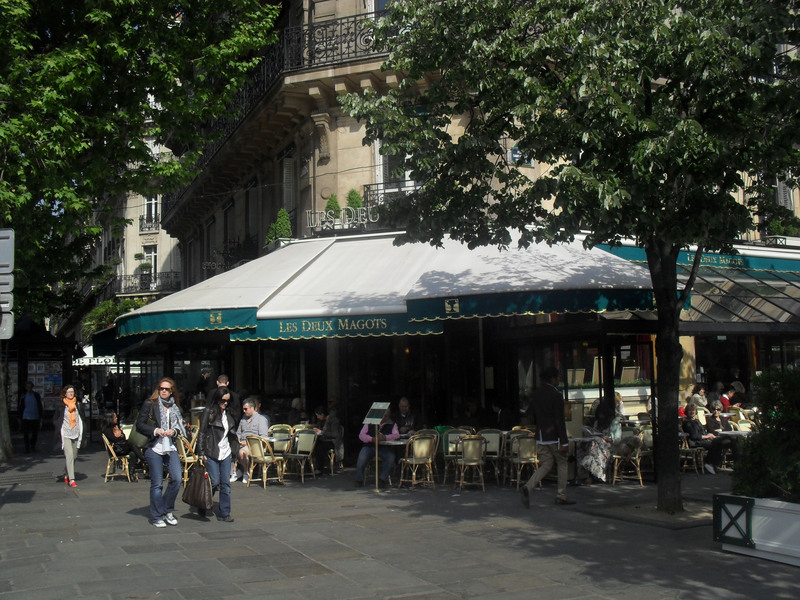 Afterwards we visited Les Deux Magots for a hot chocolate, which is now in the running to be the best hot chocolate in Paris . . . but more on that later. So I leave Paris on February 26th and I’m opening the floor to you – what do you think I should do before I leave? True, I am coming back a couple of times in my upcoming travels, but this is the last time I’ll be here for an extended period for who knows how long. So, what should I do? If there’s anything on which you want the inside scoop, leave it in the comments and I’ll organise an outing and an entry before I leave. €59 for this?! It's a folding chair! So Bénédicte was in my room again. When I was in the UK over Christmas, she discovered that I had broken my chair. After a long lecture upon my return, we put the subject to rest until the weekend before last. She had found the chair on the Maison Facile website, but it was out of stock when she visited the store. So she asked me if I could find one. At €59, I was hoping to find it cheaper, but eventually just decided to order that one online. Last Wednesday the €65 transaction, including postage, went through without a hitch. On Thursday I received an email, titled Urgent! Your order No. TFQY708 (this was a little odd, considering that my order number was WHXA188). It turned out the website was out of the chairs as well (you would think that this would be mentioned somewhere on the website, or that a notice would have popped up when I tried to buy it), and the email invited me to look at their other chairs. This would not do. I emailed back, saying I don’t want another chair; I would simply like a refund of the €65. Please inform me of when this is possible. As I hadn’t heard back the next day, I tried giving them a call. But it turns out that Maison Facile’s call centre has a 90 minute lunch break, so I’d have to wait. Today, Monday, I still hadn’t received a reply, so I tried calling again. “Maison Facile,” a woman answered the phone. “. . . no.” I repeated the order number. Slightly irritating since I ordered the chair less than a week ago and the money hasn’t even been taken from my account yet, but I’ll take what I can. After sending my email, I tried another website: Multi-Affaires. The chair was only €39 here, but the reason I originally chose Maison Facile is because I can’t see any way to actually buy the chair on Multi-Affaires. Check out the link– there’s a title, a picture, a price and a description, and even an icon that I can click to see my shopping cart, but no button to actually buy it. If anyone else can figure out how to do it online, please let me know, because the call centre wasn’t much more helpful. 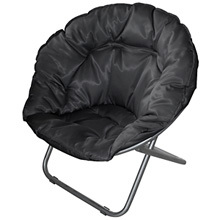 “Yes, it’s the fauteuil moon noir,” I said. After spelling it, she seemed to recognise the product. “Do you have an order number?” she asked. “No, I would like to order it now – I tried on the website, but it was impossible. There was no . . .” I paused as I searched for vocabulary, “logo to click.” Really don’t like the phone – gestures make life so much easier. “Yes, I have the website in front of me. There’s a title, a picture and a description, but no link to buy it,” I ran my cursor over the different parts of the page as if this would help her understand me. “Okay, I will look.” She went quiet as she looked at the website. After a couple of minutes she said she would look into it and call me back. An hour later and she still hasn’t. I’m not impressed with French online shopping to date. The next day they called me back to say that their website was broken, and they would contact me when it had been repaired. One week later, I called them to discover that not only was the website still not working, but the chair was out of stock. So I’ve agreed to give Bénédicte money for the chair. She’s just adding up how much I owe her for the bed . . . So I have a new job. No, I haven’t stopped teaching. In summer, Renée forwarded an email from a former BTL teacher to the current BTL teachers – she knew someone who needed some help with a few hours of admin work a week, and said it might suit a teacher that needed to make extra money. I sent in my resumé, but never heard anything. Yesterday, I received the reply: an email from Amanda, asking me to call her. Flash forward to today: I finished my one BTL class for the day at 11:15 and didn’t have anything on until my private class at 3:00. So I decided to have a bath. I lathered on a green clay face mask while the water was running. I was about to hop in when my phone rang. I ran to get it – it was Amanda. “Hull. . . ?” I answered, realising that my mask had stiffened and I could barely open my mouth. “Hi Jolie? It’s Amanda,” she said as I frantically stretched my jaw to crack the clay. “Hi,” I replied, sounding semi-normal. “I have a class at three, but I could meet you before then,” I said. We agreed to meet in an hour. I took a marathon bath and jumped on the metro to Palais Royal-Musée du Louvre. Amanda ended up being a lovely American woman going through a divorce and needing help putting five years worth of bank statements into a spreadsheet. Her apartment is beautiful – actually in the Palais Royal, the ceilings must have been at least twelve feet high. The rooms were large with moulded walls and hardwood floors and the floor-to-ceiling windows overlooked the enclosed gardens of the Palais (fact of the day– Philippe-Egalitié opened the garden to the public but forbade the police. 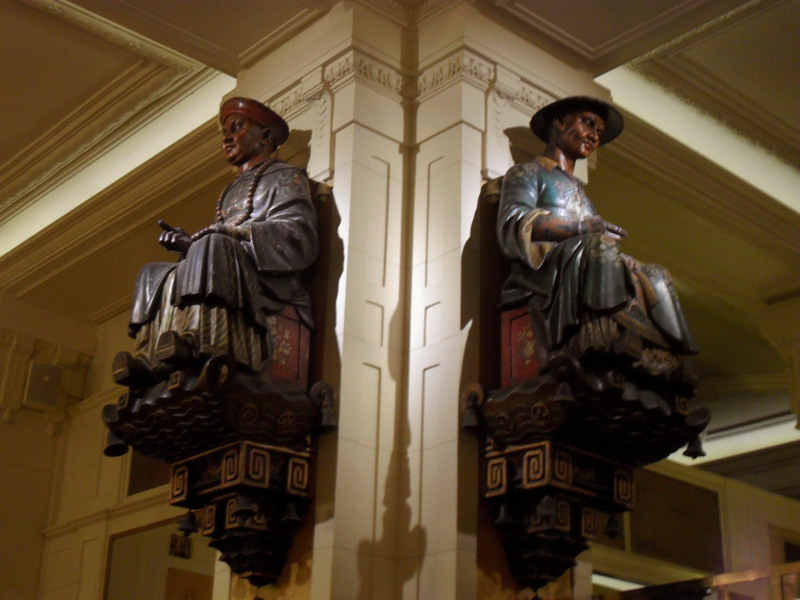 It thus became a place of liberty where artists and intellectuals gathered). 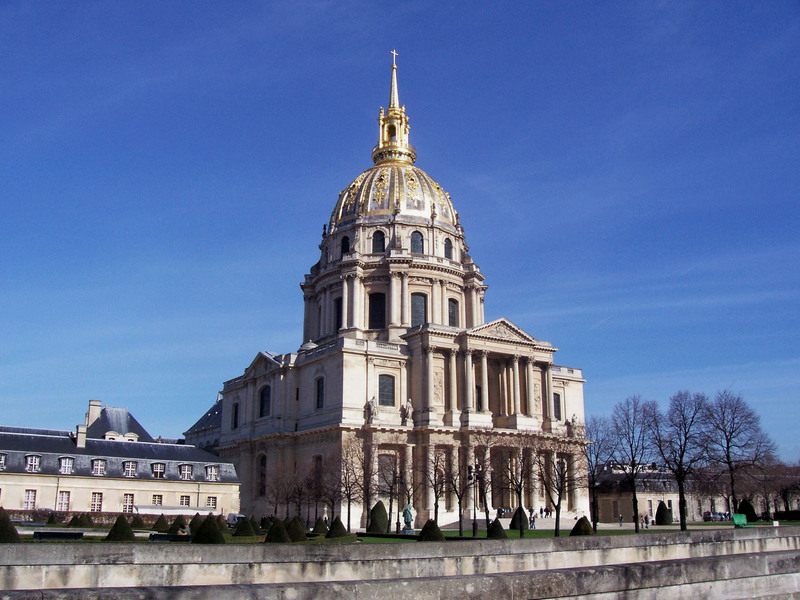 It may be the largest apartment I’ve ever seen in Paris – I didn’t know that people actually lived in places like that! The work was really simple, so I’m not sure if she really needs someone, but she seemed to be happy with the amount we got done. I’m not complaining – with this work and my private students, it looks like I’ll do quite well this month after all. After yesterday’s class I realised that I don’t think I’ve visited the left bank since the weather got cold. Possibly not since my friend D visited in early October. 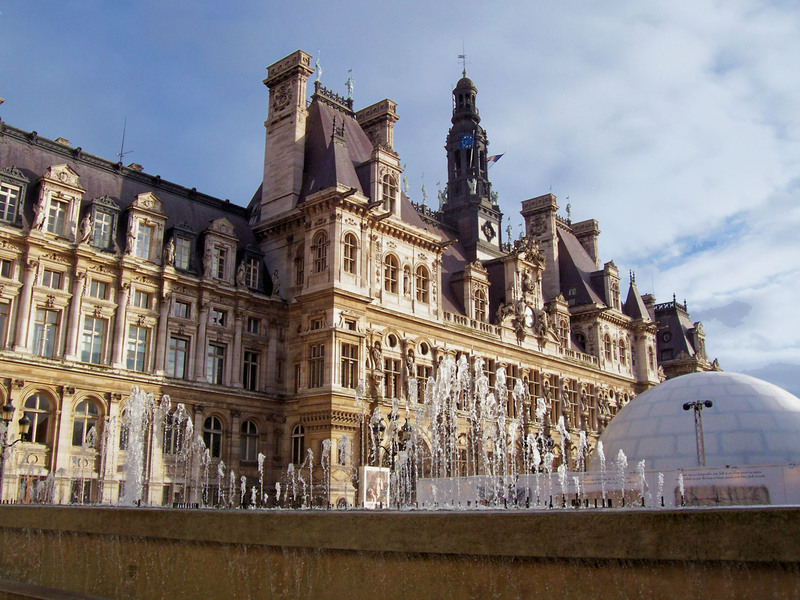 Even in Paris, most of the expats I know seem to get into a rut – the only places I seem to go now are Saint Lazare, Les Halles, Belleville and Neuilly. So I’ve started being a tourist again. time of year when I was first introduced to this city, I’m constantly reminded of how she seduced me). 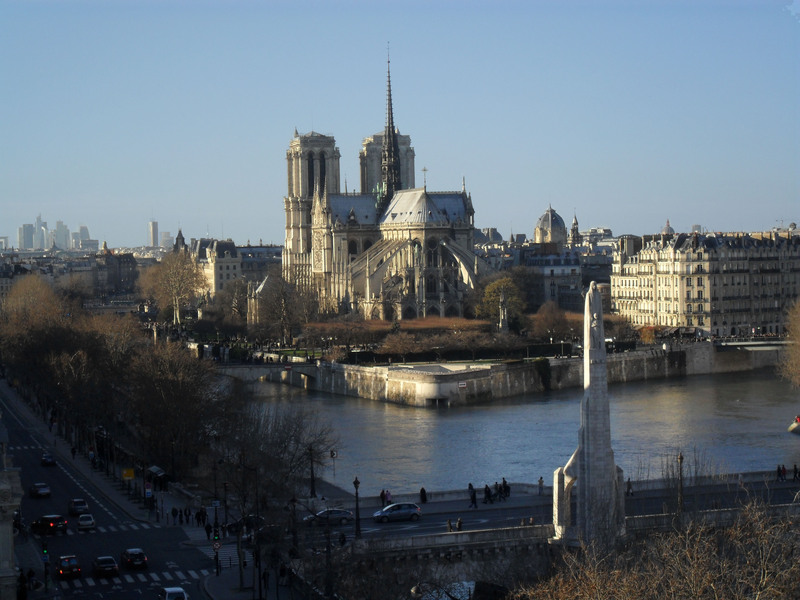 Today I went to the top of the Institute du Monde Arabe to enjoy the views of Paris and the Notre Dame, after which I strolled along the Seine. I looked through the windows of the restaurant boats, and a man offered me his hand to help me jump across a large puddle where the bank gets a bit low. 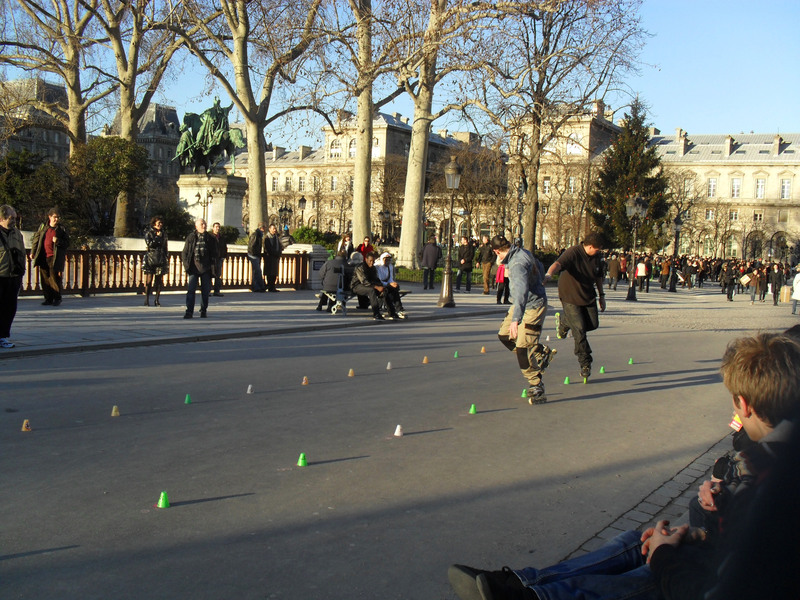 When I crossed Pont au Double, two rows of small, plastic cones lined the road and a group of boys were rollerblading. Their feet wove intricate patterns at incredible speeds – one of them was so talented he was basically dancing. As a crowd gathered, they started playing salsa and house music and, on a sunny, cloudless day, it felt like it was summer again. People meandered along the river and Paris seemed more relaxed than she has been in some time. The sun started to set as I walked down Ile Saint Louis and window-shopped, stopping to stare at small glass figures and gourmet delights. I then headed to Hotel de Ville to watch people ice-skating on the rink they set up every winter. As the temperature dropped, people started to quicken their pace again, and I knew Monday was coming. I swear – sometimes this city is so beautiful it makes me want to cry.